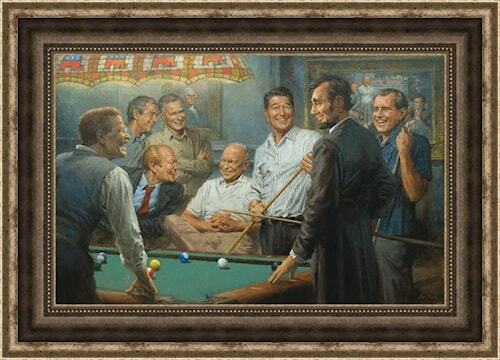 Presidential Art: Callin' the Blue of Republican Presidents chatting around a game of pool. 18 " x 12" in art print by Andy Thomas. Framed. The Presidents include Abraham Lincoln, Ronald Reagan, George HW Bush, George W. Bush, DE Eisenhower, Theodore Roosevelt, Gerald Ford and Richard Nixon.